Canadians for Justice and Peace in the Middle East (CJPME) urges the government to move promptly on the recommendations from the M-103 report put forth last month by Parliament’s Standing Committee on Canadian Heritage. The government announced Tuesday that it will be launching pan-Canadian consultations on racism as a response to the Committee’s report. Nevertheless, CJPME would prefer to see a more prompt and concrete response to the 30 recommendations of the Committee and is concerned that drawn out consultations will simply delay much-needed action by the government. Targeting funding to nascent Muslim Canadian community institutions, as part of recommendation 20. The Muslim Canadian minority is one of Canada’s newest and most vulnerable communities: its members are often unaware how to more fully participate in Canadian civic society. Increasing funding for law enforcement and security agencies to investigate hate speech and to enforce existing laws. This aligns with the Committee’s recommendation 29. Providing education and training programs to combat Islamophobia in Canada, aligned with recommendation 22 of the Committee. Mandating cultural sensitivity training for government service employees, mentioned in recommendation 26 of the Committee. CJPME points out that the Committee took a year to complete the M-103 report, when it was slated to be published after 6 months. Pan-Canadian consultations may additionally delay much need action for vulnerable communities. CJPME is also concerned that such consultations will only intensify polarized debate around the issues. 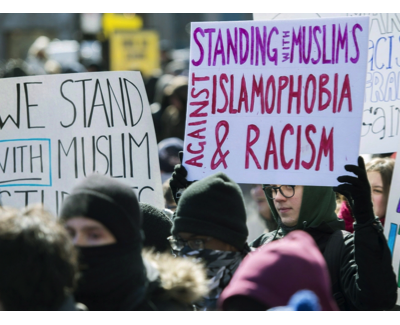 A survey co-sponsored by CJPME demonstrated that attitudes around Islamophobia and related questions are highly politically polarized, and more public sessions around well-understood phenomena may simply deepen the polarization. CJPME points out that motion M-103 was triggered by the Quebec City mosque attack, yet the Committee’s M-103 report smothers real action on Islamophobia under generalized concerns about religious discrimination overall. Beyond the Quebec City attack, Canada’s Muslim community is reeling from a surge of Islamophobic attitudes: from acts of racism faced day-to-day by Canada’s Muslims, to offensive comments by some politicians, to racist attitudes promulgated in electronic media. “Given current trends, we expect the government to provide prompt action specifically on anti-Muslim bigotry,” said Thomas Woodley, President of CJPME. Featured image is from CJPME.